Phil - Another excellent teaching article - when you write like that it blows me away. Thank you! I had the ideas from earlier articles but what I didn't have was enough understanding. The familiarity of ideas through repetition, re-working, revision - over time - the variation, the pulling out of implications - it all contributes to understanding and mostly thats on the student - but a good teacher (worth their weight in gold) makes understanding a pleasure. I wanted to learn about trading options because it makes my brain feel better - fitter, healthier. Actually mostly it makes me happy to think about the trade and trading options. You are a good teacher and I know that or I wouldn't value the subscription the way I do. It pays for itself through the pleasure of understanding alone. Thanks Phil, for banging the table on getting short and getting to cash. Usually when this happens in the market I am freaking out but I actually made money this week thanks to you. That HOV trade was a great way to re-deploy some of my cash. I have to say, hands down, this is one of the best educational experiences I've had in my life. I've even gotten my wife (accountant) into the webinars and she wants to master this concept of selling premium and making smart, conservative investment decisions. She'll eventually use this knowledge to manage her clients' wealth and make smart investment choices for them. Bib big thanks Phil!! Phil - It is nice being more discipline with my trading. Generally, I am out earlier than most, but my results, overall, are much better than they were when I was trying to squeeze 80 cups of lemonade out of one lemon! On the other side, I am learning the value of rolling and turning losses into non-losses or small gains. I so appreciate the time you have spent with me and others who have benefited greatly from your knowledge. Thank you! I am struck by several things over the last few days. First is how level-headed we all are as Greece and China develop. Second is how very helpful it is to see the different trading styles we have, partly because of personal preference and partly because of different stages of development and education. It's very helpful. Well-done, Phil, to have developed this community. Sold the BG puts I got yesterday at $1.30 for $2 just now. Might be a little early, but I'm happy with that gain. Thanks Phil. Phil/Everyone here/Thank you - What everyone here with their insightful comments (including yourself) has helped me with is that I'm greatly increasing my ability to trade more psychologically neutral, although I've got a ways to go. Two years ago I'd wake up early and my heart would race if futures weren't pointing exactly how I wanted… I've noticed an exponential leap in my discipline skills especially over this past two weeks. The old me would have ran with that trade for profits without even asking. Now I know that there are ALWAYS more trades and that I have PLENTY of options to turn a bad trade even. Also, it's more logical and less emotionally draining which lets me focus my faculties on my wife, college, my job, and studying for the ol' Series 7. Would it be safe to say that one of the most important skills to develop is the ability to adjust? I'd love to get to the point where I can look at a bracket and know, for example, what I need to sell for cover in what month in order to get my desired results. Both COF and my past DMM venture have been excellent learning experiences. Thanks, everyone. I look forward to further lessons. Phil/USO Adjustment~~ Thanks for showing us the make it even (maybe even profitable) tricks for 'fixing' a losing position. I would have never known the trick if you didn't explain it. The option adjustment techniques are very helpful. Trading stocks would probably never offer that kind of flexibilities! Thanks! HAL - Halliburton Co. – A sharp fall in Thursday’s session for oil services and sloppy cement-mixer Halliburton has not gained much traction at the end of the week. The stock today trades on both sides of unchanged and is currently at $31.71. While the prospects for additional liability are pretty much set out on the table following a report showing it provided BP with an unstable cement mix to surround the Macondo oil well, BP didn’t notice or attempt to rectify the error. Halliburton’s November puts are being sold as the stock stabilizes while the smart trade appears to be selling well out of the money call options expiring in April. Around 4,000 call options at the $36 strike price have traded to the bid telling us that an investor is taking a long stock and short call position or is simply just writing premium. The 52-week high at $35.89 remains a tall order after yesterday’s news making the short position in the calls look like a viable proposition. 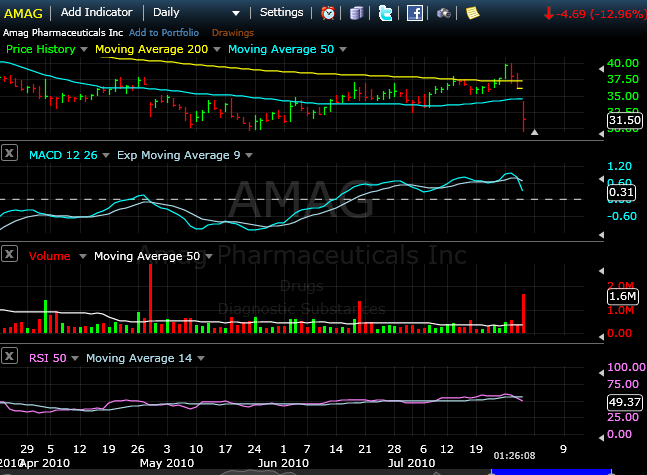 AMAG – AMAG Pharmaceuticals, Inc. – Safety concerns surrounding AMAG’s Feraheme, the biopharmaceutical firm’s intravenous iron-replacement therapy for patients with chronic kidney disease and its lead product, continue to drive shares to new lows. Shares are down 4.00% at $18.15 as of 3:20 pm ET, but earlier plunged 11.6% to touch down at an intraday- and 4-year low of $16.70. Today’s low of $16.70 put shares down 68.2% since January 12, 2010, when the stock was trading up at its 52-week high of $52.49. Erosion in the price of AMAG’s shares accelerated at the end of August when the FDA added Feraheme to a list of products touting serious risks and connected the drug to unspecified serious cardiac disorders. One options investor appears to be positioning for shares to continue to decline by enacting a ratio put spread in the October contract. The trader purchased approximately 2,500 puts at the October $18 strike for premium of $1.98 each, and sold roughly 5,000 puts at the lower October $16 strike at a premium of $0.84 apiece. Average net premium paid to establish the spread amounts to $0.30 per contract. Thus, the strategist stands ready to profit if AMAG’s shares slip beneath the effective breakeven price of $17.70 by expiration. Maximum potential profits of $1.70 per contract are available to the trader if AMAG shares fall 11.85% from the current price of $18.15 to settle at $16.00 at expiration. The ratio of twice as much sold puts as long puts held by the investor expose him to losses should shares collapse below the effective lower breakeven price of $14.30 by expiration day next month. AMAG lived up to expectations last night with a resounding -$1.01 versus expectations of -$.96 and revenues fell slightly short at a not-so-healthy $16 million from its main product, Feraheme. Analyst Robert W. Baird immediately dropped AMAG from outperform to neutral and the stock has fallen -13.51%. DHH added AMAG as a short on July 1, 2010 in anticipation of the “earnings” shortfall. We believe it is best to “sell on the news” so we are recommending covering AMAG at the market. DHH will replace the short position in the virtual portfolio to maintain our BALANCED Long/Short tilt as the market is between the 50 and 200 day MA at this time. Continuing on DHH theme of looking for SHORT opportunities that continually disappoint on “earnings” day, we are adding RAIL to replace AMAG at the market. RAIL is set to announce “earnings” on August 5, 2010 at 11am ET. The eight analysts who follow RAIL expect a loss of -$.17 with a range of -$.24 on the low side to -$.10 on the high side. Going back to Sept 2009, RAIL has disappointed analysts in a consistent fashion by delivering a profit of +$.09 versus expectations of +$.22 in September 2009, a loss of -$.47 in December 2009 when analysts were looking for a +$.04 gain, and again last quarter, when RAIL delivered -$.28 in the face of analysts’ projections of -$.17. RAIL is rated a STRONGSELL by Sabrient with a VALUE score of 25 (out of a possible 100) and a GROWTH score of 30 (out of 100). DHH is in a BALANCED L/S tilt with 8 LONG and with the addition of RAIL 8 SHORT. We will continue to monitor market trends to evaluate the need to change the tilt. Continuing on DHH theme of looking for SHORT opportunities that continually disappoint on “earnings” day, we are adding RAIL to replace AMAG at the market. 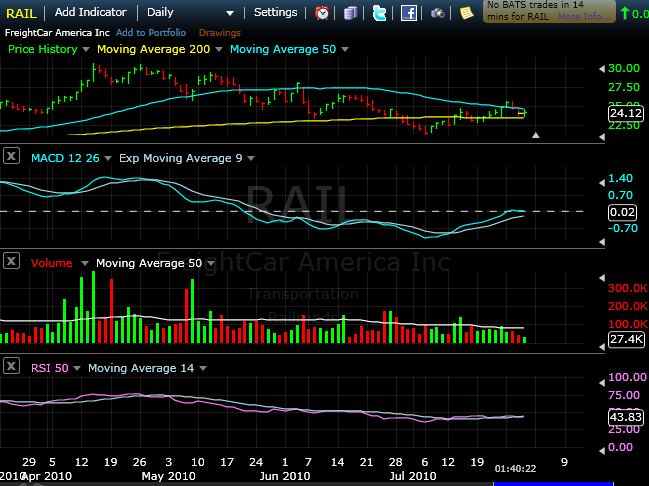 RAIL is set to announce “earnings” on August 5, 2010 at 11am ET. The eight analysts who follow RAIL expect a loss of -$.17 with a range of -$.24 on the low side to -$.10 on the high side. Going back to Sept 2009, RAIL has disappointed analysts in a consistent fashion by delivering a profit of +$.09 versus expectations of +$.22 in September 2009, a loss of -$.47 in December 2009 when analysts were looking for a +$.04 gain, and last quarter, when RAIL delivered -$.28 in the face of analysts’ projections of -$.17. You can run, you can run, tell my friend-boy, Willie Brown. You can run, tell my friend-boy, Willie Brown. Lord, that I’m standin’ at the crossroad, babe, I believe I’m sinking down. Heading into Friday July 23, 2010 the market is again at a technical crossroad with the SPX closing Thursday at 1093.7, above the 50-day Moving Average of 1085.5. The MACD 12-26-9 remains close but still under the (zero) signal line at -1.13, with the RSI 14-day at 45.26. There is lateral resistance at the 1096 level from the close last Thursday showing how the market has traveled a long way the past week to get nowhere. Amazon.com Inc. (AMZN) fell short of analysts’ forecasts after Thursday’s close and was down 14% in after-hours trading, suggesting that the market may follow the pattern it has been in most of the summer. Up 200, down 200, up 200, down 200 - wash out your savings, rinse and repeat! What a total sham of a market we have these days with machines running us up and down on virtually no news at all. Yesterday they would have you believe that Ben Bernanke caused a sell-off. How ridiculous is that? He didn’t say one thing that he didn’t already say in the Fed Minutes that were released on the 14th, which were the notes from the meeting of June 23rd so for analysts to get on TV and say “the markets were concerned by the Chairman’s comments” is beyond stupid – it’s criminal negligence. Phil’s Thrill-Ride Thursday. I believe I’m sinking down. Friday gave us a real-time example of why we use Hysteresis* and confirmations from our technical signals, MACD 12-26-9 and RSI 14-day, to select and monitor the tilt (long-short ratio) of the Dark Horse Hedge’s portfolio. The SHORT tilt Friday allowed us to make +1.37% from our 6 SHORT, 3 LONG positions while the S&P 500 gave back -2.88%. The economic data out Friday of course played a large roll in the failure of our indicators to turn from short to BALANCED. A sharp decline in the University of Michigan Consumer Index to 65 in July compared poorly with a June figure of 76 and Briefing.com’s estimate of 74.5. Google’s earnings miss didn’t help either as the S&P 500 fell through its short-term support area to close at 1064.88. The MACD reading is currently at -3.56 and RSI 14-day at 42.85 (bullish signal is above 50). 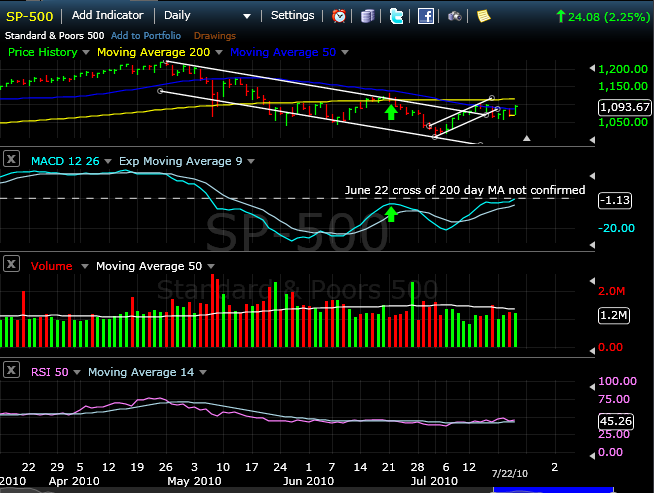 The preponderance of evidence heading into the July 19 week is that the market needs to find support in the 1040 range. Despite the poor economic data that pushed the market lower on Friday, 19 of 23 S&P 500 companies reporting thus far reported better than projected EPS, and 15 of them beat revenues as well. Earnings reports will continue to flow in this week. 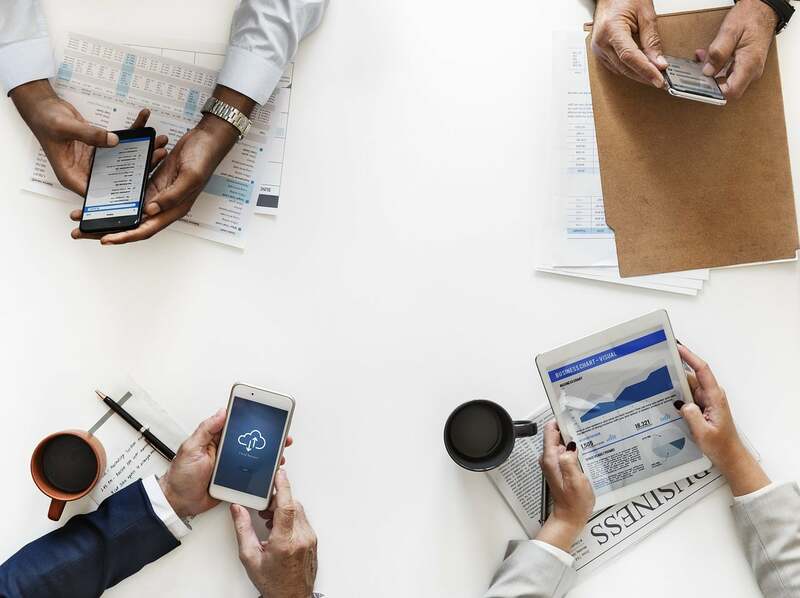 In our portfolio Western Digital Corp (WDC, long position) reports profits on Tuesday while USG Corp (USG, short position) and Sun Trust Banks Inc (STI, short position) report their losses on July 22. We will continue to monitor the market action and look for guidance on entering new positions. Key support areas appear to be 1040, 1022 and then 995. Dark Horse Hedge maintains 10% cash for swing trade opportunities and we are highlighting one for entry on Monday at the Open. SHORT Terex Corp. (TEX) at the Open Monday. Scott Brown, Managing Director – Retail Division at Sabrient, is launching a newsletter with Phil’s Stock World based on the highly successful and popular Investors’ (H)Edge product. The Dark Horse Hedge newsletter is a Long/Short retail portfolio taking advantage of technical market trends to tilt the balance of LONG vs. SHORT in bearish, bullish or range bound markets for added Alpha (the measure of return on a risk adjusted basis). Long and short equity positions taken in The Dark Horse Hedge portfolio will be chosen using to Sabrient’s rating system, which is primarily based on fundamental criteria. Because the stock positions will generally be held for intermediate to long periods, these positions are ideal for using with option strategies taught by Phil Davis, of Phil’s Stock World. The Dark Horse Hedge (DHH) newsletter will follow a number of guidelines in an attempt to minimize systemic risk, or “Beta.” Beta is a measure of the volatility of a portfolio in comparison to the market as a whole. To keep beta low, the DHH portfolio will have both long and short positions. Consequently, dramatic moves in the market will always be in the direction of at least part of the portfolio. Using Sabrient’s rating system, we will focus on being long high quality stocks, and short low quality stocks. Long positions should fare better than average during market selloffs. In contrast, the short positions, selected from the lowest ranking stocks, should perform well during selloffs. These stocks are also expected to underperform higher quality names in a stronger market. This strategy is designed to balance the goal of attaining Alpha with the desire to keep Beta relatively low. We will follow this list of guidelines in building the DHH portfolio. 1. When fully invested, the Portfolio will have 24 positions. However the portfolio may not be fully invested. VIX – CBOE Volatility index – The fear-gauge spent the better portion of the session in the red, but edged higher in late-afternoon trading to stand up 1.20% to 19.29. Options players busily populated the VIX with a number of interesting trades during the session. One transaction in particular, however, focused our attention on activity in the May contract. A hefty ratio call spread involving a total of 30,000 call options at deeply out-of-the-money strike prices was established on the VIX today. 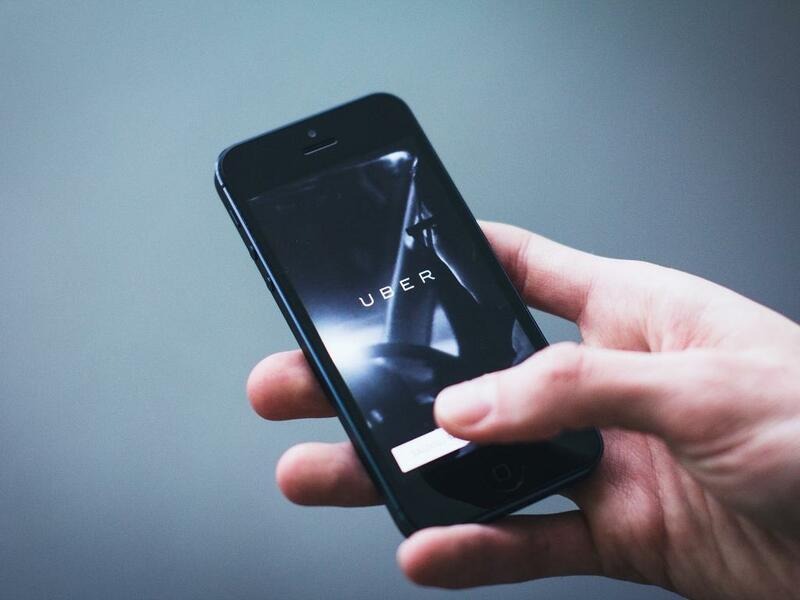 The investor purchased 10,000 calls at the May 27.5 strike for a premium of $1.50 apiece, and sold 20,000 calls at the higher May 35 strike for $0.70 each. The net cost of the transaction is reduced to just $0.10 per contract. It is possible the investor was motivated to put on the spread because of the low cost of the trade and because of the allure of potential profits going forward. The trader appears to believe the VIX will likely breach the breakeven point on the spread at 27.60 in the next three months to expiration, but doubts the fear-gauge will explode up to the mid-30’s. Evidence to support such a scenario is abundant. First, the investor can almost taste victory because the VIX traded as high as 29.22 on February 5, 2010, which is well above the point at which he garners profits. Second, losses above and beyond the premium paid to initiate the trade seem unlikely because the Index failed to rise above 30 since early November of last year. The resistance of the volatility index at the 30-level persisted despite the drop in global markets after China waved the fear-flag by announcing plans to rein in its country’s economic growth at the end of January. Additionally, angst regarding Europe’s debt crisis and threats to the strength of the Euro were also unable to boost the VIX up above 30. The ratio call spread described above looks to be a relatively cheap way to profit from another bout of market turmoil or jump in investor uncertainty ahead of May expiration. We note that the index must rally at least 43% from its current level before the investor breaks even on the transaction at 27.60. Here’s a chart that shows you exactly why the Fed rigs the stock market using QE, low interest rates, and propaganda jawboning. The Fed has a dual mandate– stable prices (har de har) and full employment. For some reason the Fed has redefined “stable” prices as 2% inflation, but that’s a subject we’ve already beaten to death. And we will continue to beat it to death.